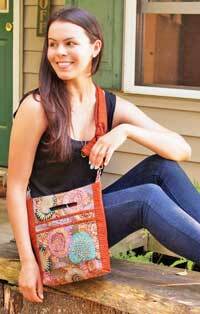 The Cross Body Traveler Pattern by Marlous Designs is an easy to carry (and make!) crossbody bag with a cell phone pocket, 2 small pockets, and 1 large pocket on the front outside of the bag. The back of the bag has instructions to add one large pocket for an iPAD, a larger zippered pocket, and a smaller pocket covered with a secure flap. This pattern also comes with 2 swivel clasps! Finished size is 12 3/4" x 10" x 2 3/4"D.